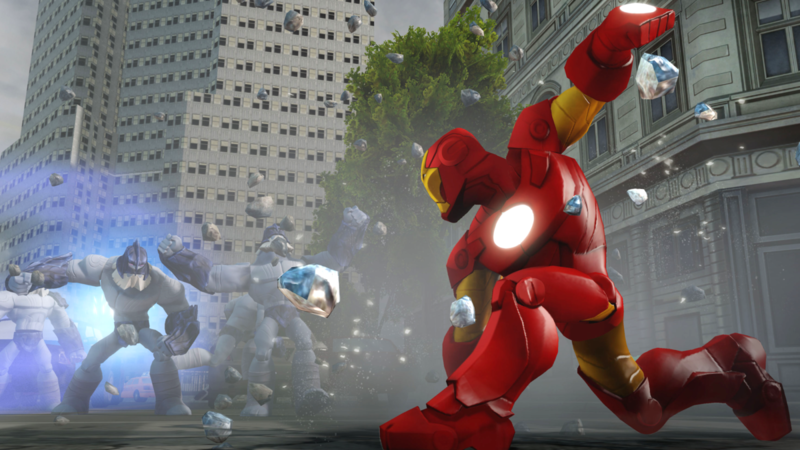 Disney Infinity: Marvel Super Heroes is a game with many pieces, and I’m not just talking about the tiny figurines of Disney and Marvel characters required to play it. It’s a game where you can build an entire world using bits of Disney and Marvel lore, filling it out with buildings and characters from your favorite movies or comics. The starter kit is also a game where you run (or fly) around punching bad guys (or hitting them with your shield or arrows or magical hammer) until they explode into tiny glowing orbs. Oh, and various characters give you extra tasks to complete as you roam through a miniature Manhattan, and sometimes, if you have the right power disc, you’ll defend Asgard by placing turrets and walls in strategic locations. There’s a lot going on here. Those figures, though, are crucial. 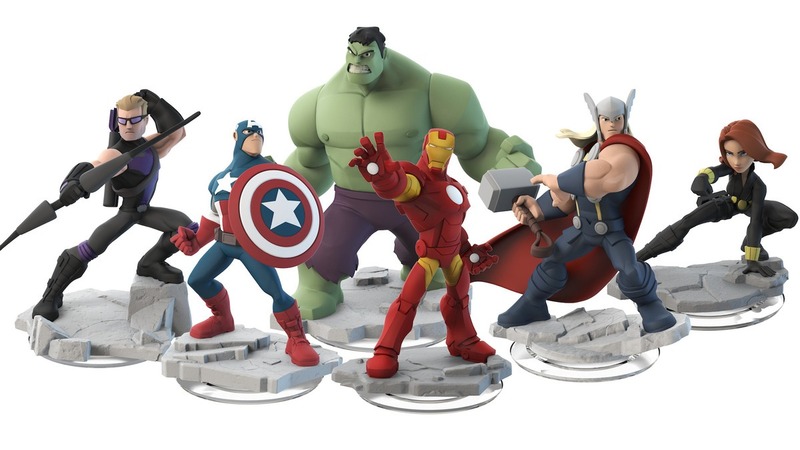 Each statue unlocks an in-game version of that character when placed on the “Infinity Base” platform, which connects to gaming consoles through a USB port. The starter kit comes with three Marvel superheroes: Thor, Iron Man and the Black Widow. When you put them on the platform they’ll materialize in the game. Use them in the Toybox to build your ideal Disney / Marvel universe, or pop the Avengers playset (also included with the starter kit) to beat up Loki and his Frost Giants in a story written by Marvel writer Brian Michael Bendis. If this sounds familiar, well, this is exactly how Disney Infinity worked, too. And if you were a huge nut for the first game, don’t worry: All your characters and power discs will still work in Marvel Super Heroes. Characters are still locked out of playsets that they aren’t connected to, though, so although you can use Sorcerer’s Apprentice Mickey in Marvel Super Heroes’ Toybox, you can’t watch him bust on Frost Giants side-by-side with the Hulk. Unlike the first game, whose starter kit came with a playset featuring three different kinds of play based on Pirates of the Caribbean, Monsters University and The Incredibles, Marvel Super Heroes only arrives with the Avengers playset. It is not particularly good. Set in the southern third of Manhattan, you’ll complete one repetitive mission after another, taking your orders from such unplayable characters as Nick Fury, the Wasp and Captain Marvel. There are only a handful of mission types that you’ll run through a half-dozen or so times each, from clearing out an intersection full of giants, to protecting a piece of machinery as it powers up. The starter kit also comes with two power discs with new game modes built in the Toy Box. As mentioned above, one of them pits Thor against waves of giants trying to steal Odin’s treasures. Before each wave Thor can use the coins he wins from defeating enemies to place new defensive structures around the map. The other, Escape from Kyln, sees the Guardians of the Galaxy characters fighting their way out of the space prison from the movie. Both are simple and repetitive, but are shorter than the main playset, which is definitely a plus. Like the first game, the true draw is the Toybox. The playsets rarely possess that Disney magic, but the Toybox lets you create your own. There’s an incredible variety of options to choose from, with buildings and objects from Disney animated shorts, full-length movies, TV shows, theme park attractions, and now all the Marvel pieces. Separately sold power discs can unlock new patterns for the sky and entire themes for your Toybox, and can also unlock new objects to be used by your characters during play. You can also unlock new options by playing the playsets or completing basic tasks within the Toybox. Shameless Disney fanatics will waste entirely too much time tooling around inside the Toybox. Unlike the first game, Marvel Super Heroes lets you create interior spaces in the Toybox mode. It’s a welcome addition for anybody who likes decorating their home Animal Crossing or The Sims. You can create rambling mansions and design each room individually, mixing and matching styles ripped from Fantasyland, Tomorrowland and various other Disney and Marvel locales. I don’t know if Drax the Destroyer would find much to enjoy about interior decorating, but I do know that he has an amazing house in my Toybox. This new Toybox is a nice step up from the first game’s. Beyond the interiors, the creation tools are easier to use, with a quick jab of the d-pad pulling up the magic wand that lets you erase or create new turf or buildings. The dull playsets might let you level up your characters and unlock new items for the Toybox mode, but Marvel Super Heroes wouldn’t be any worse if it ditched the playsets and stuck to the Toybox mode. If you don’t care about Disney, you probably won’t care about Disney Infinity. 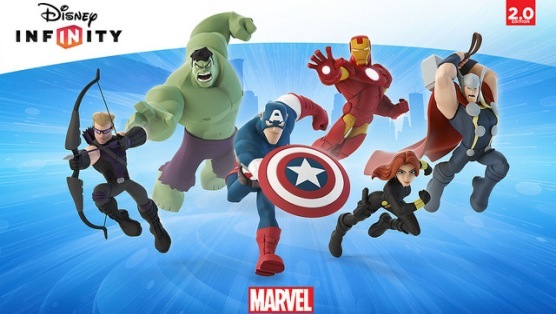 If you don’t care about Marvel super heroes, you probably won’t care about Disney Infinity: Marvel Super Heroes. If you (or your child) gets incredibly excited whenever you think about Disneyland or see that Marvel Studios flipbook logo, you’ll wind up owning more of these little statues than you know what to do with. Garrett Martin edits Paste’s games section and reviews games for the Boston Herald.